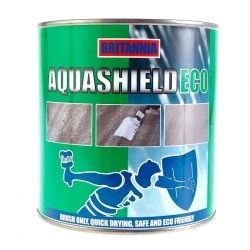 Britannia Aquashield Eco is an elastomeric, solvent-free waterproofing coating. 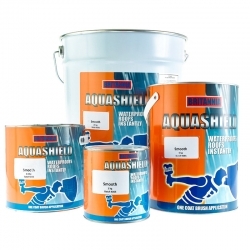 Suitable for general maintenance work, it needs just one coat to provide a durable, water-resistant finish. 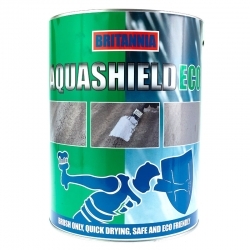 Britannia Aquashield Eco is an excellent waterproof coating that is suitable for general maintenance work. 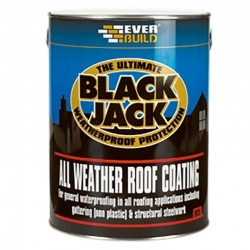 Only one coat is required, and this will provide a durable water-resistant finish. The coating is a water-based elastic acrylic coating that is eco-friendly. 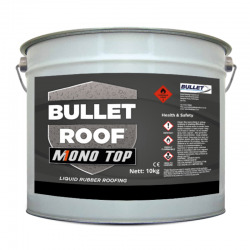 Ready for use on flat and pitched roofs, weathered asphalt and bituminous surfaces, gutters, concrete, brickwork, GRP and fibreglass, felt and metal (galvanised and ferrous). Public buildings - Councils are not only under pressure to spend public money responsibly, they also know they have a responsibility to the environment. So when it comes time to renew the waterproof coating on top of a library, council office or other public building, they know that cost is not the only factor, but that all-important "eco-friendly" badge. 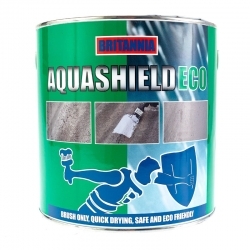 Safe in the knowledge that Britannia Aquashield Eco is solvent-free, councils will have the peace of mind they are applying an effective waterproof coating that is eco-friendly. Cottage - The general definition of a cottage is a small dwelling of traditional build but can also be applied to modern construction designed to resemble a traditional house. 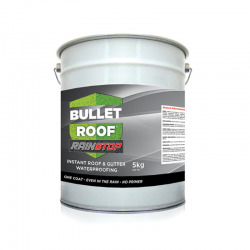 With this in mind, it is almost obscene to ignore the ecology of the environment; coating the roof in a solvent-based paint is certainly outside the remit of a traditional dwelling such as a cottage, even if using modern construction techniques. 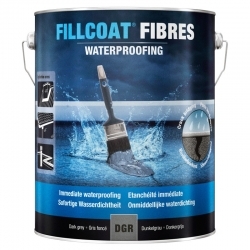 Applying this water-based waterproof coating ensures cottages get the protection they need from the rain but are also satisfying the ecological aspects of their home. 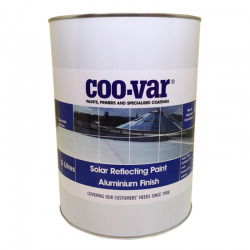 A water-based highly elastic acrylic coating. Dries to form durable and water-resistant finish. Clear all areas of moss, lichen and debris by brushing or power washing and remove surface water and any contamination such as Oil or Grease and allow to dry. Apply Britannia Fungicidal Wash to prevent further fungal/algal growth. 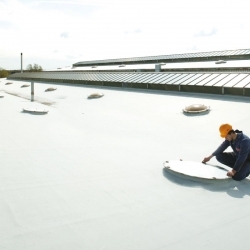 Most roofing substrates to be treated will not normally require priming. 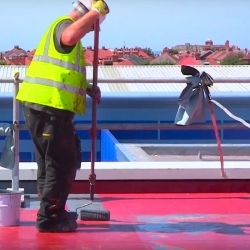 To the dry and cleaned surface, apply a generous coat of Britannia Aquashield Eco Waterproof Roof Coating by brush or squeegee, at the minimum specified spreading rate as stated above under the heading. Application Temperature should be between 5°C-25°C. Highly porous/friable surfaces: Concrete and Asbestos Cladding, Sheeting and Guttering should be primed with Britannia Aquashield Eco Waterproof Roof Coating thinned 10% with water prior to overcoating with a second coat of Britannia Aquashield Eco Waterproof Roof Coating. These Surfaces must be jet washed prior to priming. 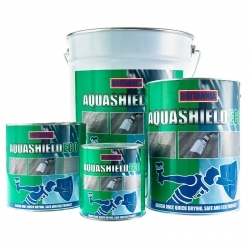 Fibrous cement corrugated sheeting: two coats of Aquashield Primer must always be applied to this substrate. Metal surfaces: Ferrous-New, Weathered and previously painted galvanised iron and steel. 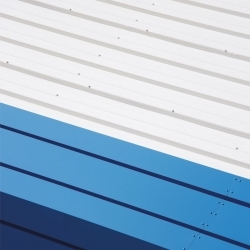 Non-Ferrous Metals - Aluminium sheeting & Aluminium Alloy Box gutters and previously painted non-Ferrous Metals. All these areas should be suitably prepared and primed as appropriate (see separate technical sheet) before application of Britannia Aquashield Eco Waterproof Roof Coating. 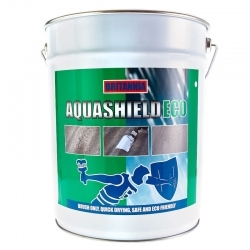 Non-porous substrates: Slate, Polished bricks should be power washed abraded and completely dry, free from any contamination to achieve adhesion of the Britannia Aquashield Eco Waterproof Roof Coating. Bitumen and asphalt surfaces: Can be used as an isolator over new asphalt, tar or bitumen surfaces. Aged bitumen can be liable to crack and therefore further advice must be taken. 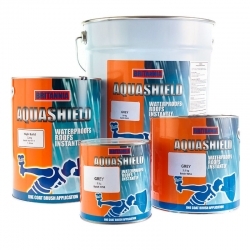 Splits, cracks, joints, seals and crazed areas: These should be cleaned out with either a scraper or a stiff bristle brush and primed before applying Aquashield Eco thinned down 10% with water. A top coat of Aquashield Eco should then be applied. Surface faults: Repair all faults in the surface with either Britannia’s Reinforcing Scrim in the first of two coats or using a proprietary filler. Previously painted or coated substrates: It is good practice to inspect and carry out adhesion tests on any existing coating prior to application of the coating. 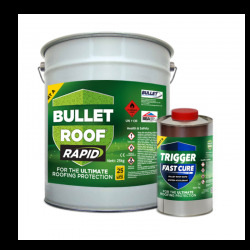 In areas where excessive movement may occur, additional reinforcement must be incorporated into the coating. 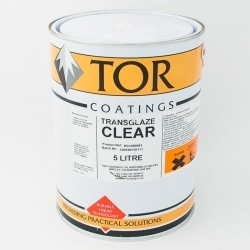 Tor Elastaseal Z Accelerator Solution (RC143) is a single pack coloured, solvent thin additive for use in conjunction with 12.5 litre units of Tor Elastaseal Z Embedment Coat (RC140), Elastaseal Z Top Coat (RC141) and Elastaseal Z Fibretex (RC142) to accelerate cure and enable faster return to service of the roof. Roofs become slippery when wet and extreme caution should be exercised when accessing any roof area for maintenance. 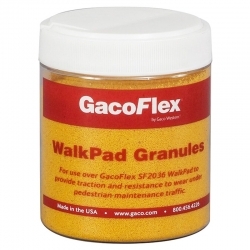 GacoFlex WalkPad Granules complete the GacoFlex SF2036 WalkPad walkway system providing a traction enhancing textured surface. 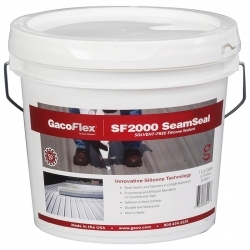 Gaco Liquid Roof Tape is a thick, high-build, rubber-like liquid comprised of 100% silicone and microfibers. 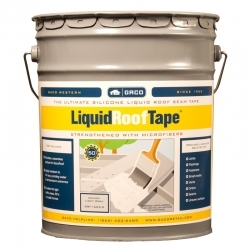 The unique properties allow it to replace traditional rubber and mesh seam tape when used in conjunction with GacoPro Roof Coating.